A study by two scholars at Simon Fraser University says that the Enbridge Northern Gateway project is much more hazardous to Kitimat harbour, Douglas Channel and the BC Coast than Enbridge has told the Joint Review Panel. The study by Dr. Thomas Gunton, director of the School of Resource and Environmental Management at SFU and Phd student Sean Broadbent, released Thursday May 2, 2013 says there are major methodological flaws in the way Enbridge has analyzed the risk of a potential oil spill from the bitumen and condensate tankers that would be loaded (bitumen) or unloaded (condensate) at the proposed terminal at Kitimat. 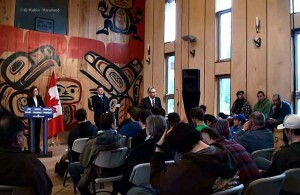 Enbridge Northern Gateway responded a few hours after the release of the SFU study with a statement of its own attacking the methedology used by the two SFU scholars and also calling into question their motivation since Gunton has worked for Coastal First Nations on their concerns about the tanker traffic. One crucial factor stands out from the Gunton and Broadbent study (and one which should be confirmed by independent analysis). 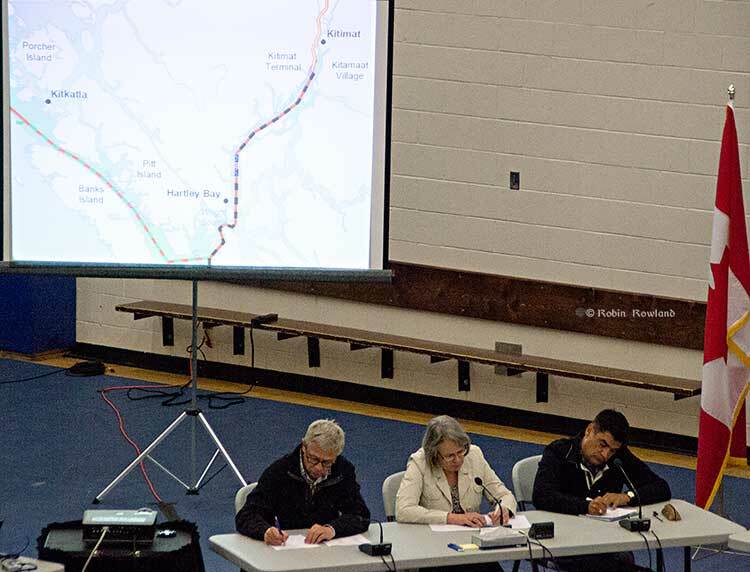 The two say that Enbridge, in its risk and safety studies for the Northern Gateway project and the associated tanker traffic, consistently failed to consider the possibility of a combination of circumstances that could lead to either a minor or a major incident. Up until now, critics of the Northern Gateway project have often acknowledged that Enbridge’s risk analysis is robust but has consistently failed to take into consideration the possibilty of human error. As most accidents and disasters happen not due to one technical event, or a single human error, the SFU finding that Enbridge hasn’t taken into consideration a series of cascading events is a signficant criticism. Overall the SFU study says there could be a tanker spill every 10 years, not once in 250 years, as calculated by Enbridge. The study also bases its analysis of the possibility of a spill not on Enbridge’s estimates before the Joint Review Panel but on the company’s actual track record of pipeline spllls and incidents and concludes that there could be between one and 16 spills (not necessarily major) each year along the Northern Gateway pipeline. Enbridge said the possibility of tanker spill was 11.3 to 47.5 per cent over the 30 year life of project. The SFU study says the possibility of a spill within the 30 years is 99.9 per cent. The SFU study says it is likely there will be a small spill at the Kitimat Enbridge terminal every two years. The SFU study says that while Endridge did study maneuverability of tankers, it paid little attention to stopping distance required for AfraMax, SuezMax tankers and Very Large Crude Carriers. The SFU study says Enbridge inflated effectiveness of the proposed tethered tugs and maintains the company did not study ports and operations that use tethered tugs now to see how effective tethering is. The SFU says Enbridge’s risk analysis covered just 233 nautical miles of the British Columbia coast, where as it should have covered entire tanker route both to Asia and California, raising the possibility of a tanker disaster outside British Columbia that would be tied to the Kitimat operation. Based on data on tanker traffic in Valdez, Alaska, from 1978 to 2008, the SFU study estimates probability of a 1,000 barrel spill in Douglas Channel at 98.1 per cent and a 10,000 barrel spill at 74.2 per cent over 30 year Gateway life. The Valdez figures account for introduction of double hulls after Exxon Valdez spill in 1989 and notes that spill frequency is much lower since the introduction of double hulled tankers. According to a study by Worley Parsons for Enbridge in 2012, the Kitimat River is the most likely area affected by an unconstrained rupture due to geohazards in the region. According to the Worley Parsons study, geohazards represent the most significant threat to the Northern Gateway pipeline system. The SFU scholars list a series of what they say are major methological or analytic flaws in the information that Enbridge has presented to the Joint Review Panel, concluding that “Enbridge significantly understates the risk of of spills from the Northern Gatway. Enbridge’s spill risk analysis contains 28 major deficiencies. As a result of these deficiencies, Enbridge underestimates the risk of the ENGP by a significant margin. Reliance on LRFP data that significantly underreport tanker incidents by between 38 and 96%. the oil and condensate pipelines. Part of the problem for Enbridge may be that when the company appeared before the Joint Review Panel it has repeatedly said that will complete studies long after approval (if the project is approved), leaving large gaps in any risk analysis. The SFU study may have one example of this when it says Enbridge did not complete any sensitivity analysis for condensate spills at Kitimat Terminal or the condensate pipeline. Mr. Gunton based his failure frequency analysis on a small subset of historical failure incident data. Why would he limit the source of his data to two pipelines with incidents not reflective of the industry experience and not reflective of the new technology proposed for Northern Gateway? The study results are not borne out by real world tanker spill statistics. Based on Mr. Gunton’s estimates we should expect 21 to 77 large tanker spills every year worldwide while in reality after 2000 it has been below 3 per year and in 2012 there were zero. 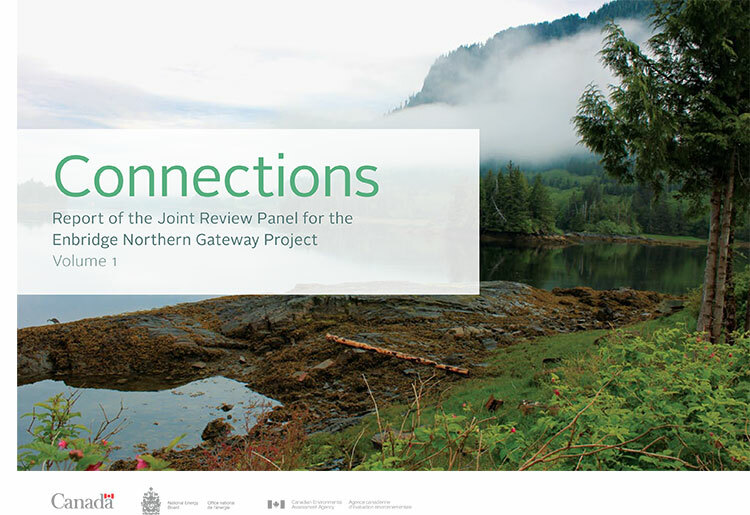 We are very concerned about the misleading report released by Mr. Gunton, who was a witness for the Coastal First Nations organization during the Northern Gateway Joint Review Panel process. Mr. Gunton should have made his study available to the JRP process, the most thorough review of a pipeline that’s ever taken place in Canada. All of Northern Gateway’s conclusions have been subject to peer review, information requests and questioning by intervenors and the Joint Review Panel. Enbridge’s statement also ignores the fact under the arcane rules of evidence, any study such as the one from Simon Fraser had to be submitted to the JRP early in the process, while evidence was still being submitted. The recent ruling by the JRP for closing arguments also precludes anyone using material that was not entered into evidence during the actual hearings. That means that the SFU study will be ignored in the final round of the Joint Review Panel, which can only increase the disillusionment and distrust of the process that is already common throughout northwest British Columbia. A new US report is slamming Enbridge for its record on oil spills, just as the BC government set out strict new conditions for building pipelines and tanker traffic in the province. At the same time, the US Academy of Sciences has opened a new investigation into diluted bitumen. A letter critical of Enbridge, previously overlooked by the US media is getting new traction, as the anniversary of the Marshall, Michigan, Kalamazoo River spill approaches on July 25. Enbridge, so far, has not responded to the National Wildlife Federation report. As the biggest transporter of Canadian tarsands oil into the U.S., Enbridge has aresponsibility to the American public to manage their operations in a manner that protects our comm unities and natural resources. But tarsands oil is a very different beast than conventional crude oil, and it is difficult to transport the former safely through pipelines that were designed for the latter. That’s because tarsands oil is more corrosive(due to its chemical mixture)and abrasive(due to high-gritminerals), weakening the pipes to the point that they are more susceptible t oleaks and ruptures. Remarkably, there are no standards in place to ensure that new pipelines are built, maintained and operated with this fact in mind. fossil fuel companies have a ‘stranglehold’ on our political establishment, preventing even modest initiatives that could make our energy safer and cleaner. That lobby strategy keeps in place a system that’s led to 804 spills by Enbridge alone in the last decade, and a total of 6,781,950 gallons of oil spilled in the U.S. and Canada. 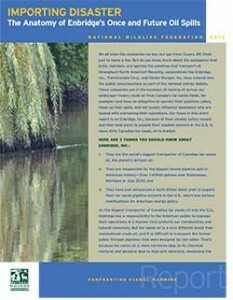 “Rather than focus on safety and cleanup, Enbridge is recklessly moving ahead with plans to expand their pipeline network in the Great Lakes region and the Northeast, and to double down on high carbon fuel that is proving nearly impossible to clean from Michigan’s waters,” said Beth Wallace, NWF’s Great Lakes outreach advisor. NWF’s report recommends comprehensive reforms to break the cycle of spills and pollution that continue to threaten communities and speed global warming. Among them, the report calls for stronger safety standards that account for increased dangers associated with heavy tar sands oil, increasing investment in clean energy and efficiency, and campaign and lobbying reforms that would put impacted citizens on a level playing field with Big Oil in the halls of Congress. The Kalamazoo spill may have been a poster child for corporate negligence but it is far from the company’s only black mark. According to Enbridge’s own reports, between 1999 and 2010, they have been responsible for at least 800 spills that have released close to seven million gallons of heavy crude oil into the environment — or approximately half the amount of oil that spilled from the Exxon Valdez in 1989. Canada has seen its own share of Enbridge heartache, including a 61,000 gallon spill earlier this summer near Elk Point, Alberta. US media covering the National Wildlife release and looking to the anniversary of the Kalamazoo disaster, are now quoting an overlooked letter from the US advocacy group Public Citizen issued on June 25. Concerned about Keystone XL pipeline, the advocacy group sent a letter to the Texas House of Representatives, recommending that the state should not wait for US federal rules to prevent tar sands pipeline spills. Public Citizen called the industry’s track record “troubled” and asked the committee to take up legislation that would give Texas broader authority over pipelines. The committee will examine state regulations governing oil and gas well construction and integrity, as well as pipeline safety and construction, to determine what changes should be made to ensure that the regulations adequately protect the public. Public Citizen will testify in support of stronger rules for the Seaway pipeline (an existing line repurposed to carry tar sands instead of crude oil), the Keystone pipeline (whose southern leg is not yet built) and proposed future tar sands pipelines. “These companies keep calling it petroleum, but it’s not – these are pipelines of poison,” said Tom “Smitty” Smith, director of Public Citizen’s Texas office. An ad hoc committee will analyze whether transportation of diluted bitumen (dilbit) by transmission pipeline has an increased risk of release compared with pipeline transportation of other liquid petroleum products. Should the committee determine that increased risk exists, it will complete a comprehensive review of federal hazardous liquid pipeline facility regulations to determine whether they are sufficient to mitigate the increased risk. On June 25, the committee added three industry experts to the panel as there is growing scrutiny over dilbit in the US, which could become an issue in the presidential race.